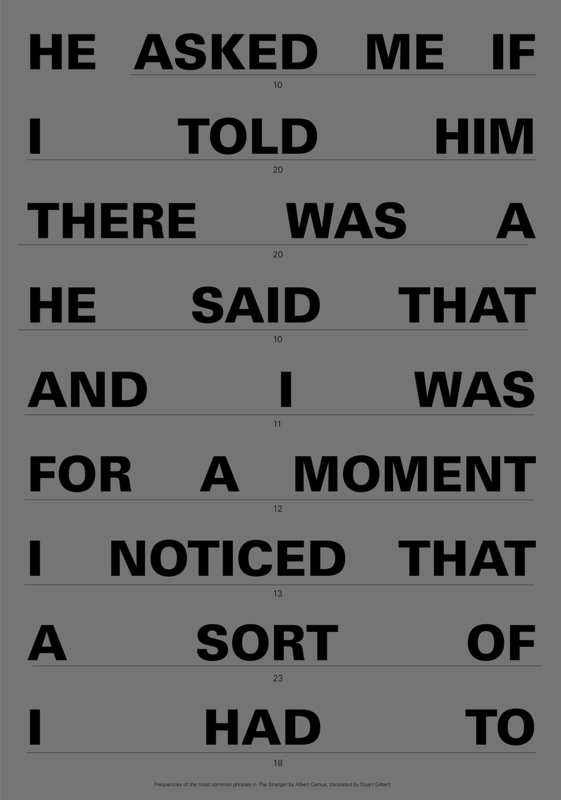 Sentence lengths and punctuations affect readers’ experience when reading through text. The Stranger by Albert Camus, in particular, utilizes short sentences, frequent pauses and simple sentence structures to create an atmosphere of detachment, indifference and resignedness. 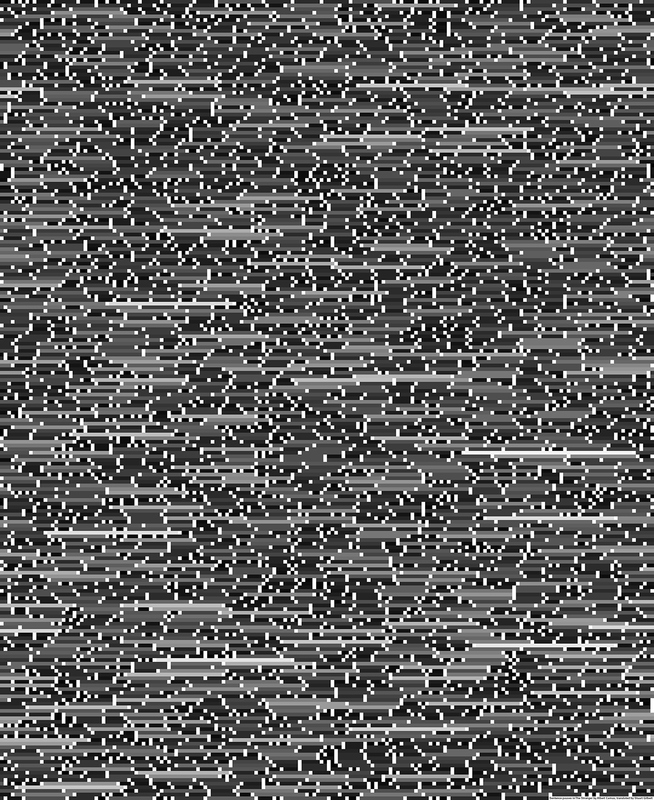 In this project, I gathered statistics from the 34,698-word novel with a program written in Python and visualized all the fragments and pauses using the system notated below in Processing. The visual system was created to differentiate The Stranger from other literary work, highlighting the choppiness or frequent pauses of the writing. Associated with the impact they have on readers, shorter fragments are darker and longer fragments are lighter in color. Taken into consideration the audience and their experiences with reading, an English translation by Stuart Gilbert was used as original text. In a sense, the translator's perspective is also present in the visualization. However, the algorithm can potentially be performed on any text in digital format. As part of the explorational process with Python, I also enumerated each 3-word-phrases to find out the most common ones. What came as a surprise was that the phrases actually captures the spirit of the novel. I arranged some the most common phrases in a specific sequence inviting people to come up their own narrative, as if coming up with their understanding of the novel. 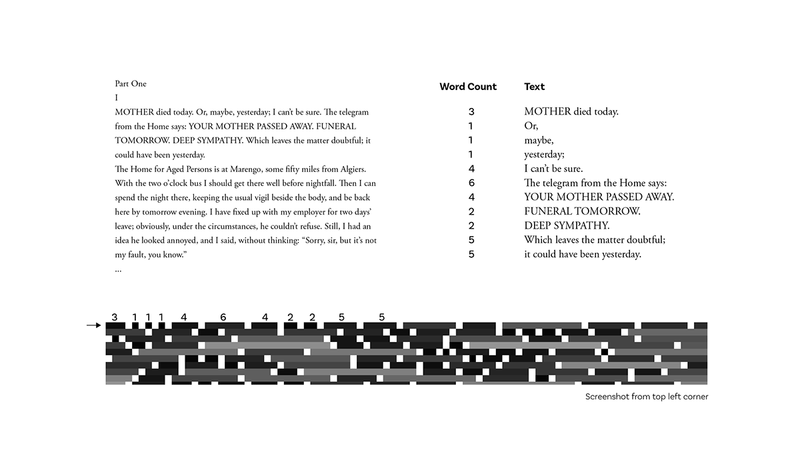 Computational visualization of sentence lengths in The Stranger by Albert Camus.